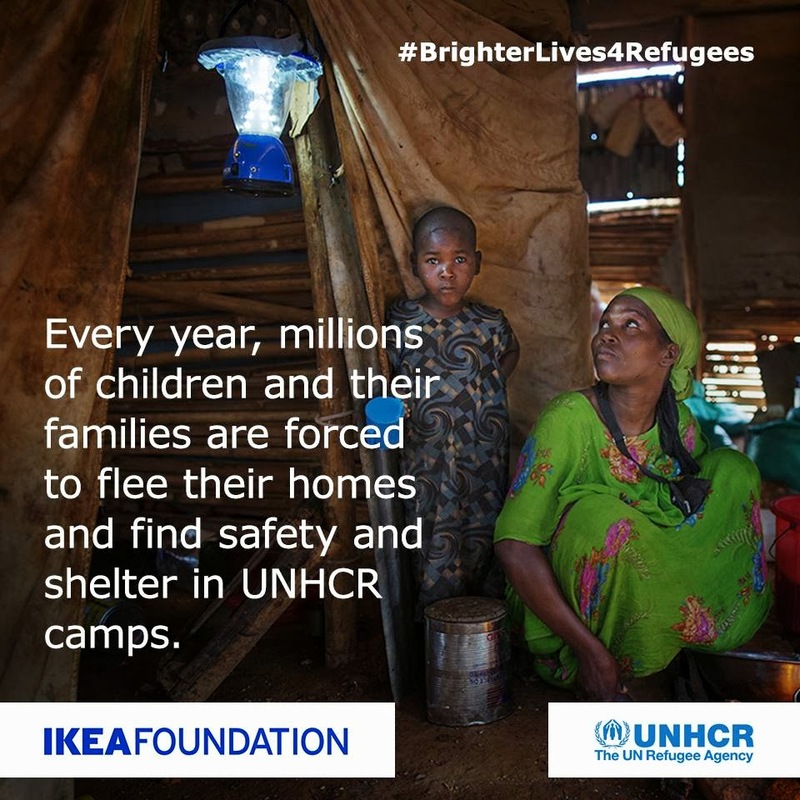 IKEA Foundation has announced the launch of a new good cause campaign, 'Brighter Lives for Refugees', that will run in IKEA stores globally from February 3 to March 29, 2014. 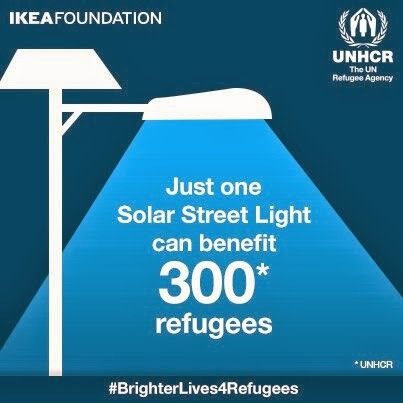 For every LEDARE (LED light bulb) sold during the campaign, the IKEA Foundation will donate $1.00) to the United Nations refugee agency (UNHCR). "There is no denying the overwhelming need for responsible members of the global community to step forward and do something to improve the lives of these vulnerable people." Simple activities such as visiting the toilet, collecting water or returning to the shelter from elsewhere can become difficult and dangerous, particularly for women and girls. The improvements funded by the campaign will make each refugee camp a safer and more suitable home for refugee children and their families. In addition, the campaign will also fund improved primary education. • Solar street lights can improve safety in refugee camps by reducing the risk of crime, including sexual and gender-based violence. • Solar lanterns help children study after dark, improving results in school. • Solar street lights enable people to have more community gatherings and social activities. 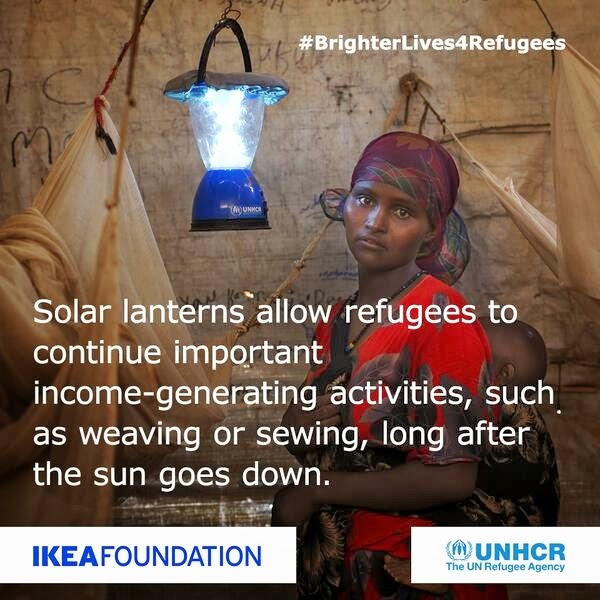 • Solar lanterns allow refugees to continue important income-generating activities, such as weaving or sewing, long after the sun goes down. • Solar lanterns enable refugees to run their small shops and kiosks into the evening so they can earn a sustainable income. "Life in a refugee camp can be very hard, particularly for children. The absence of powered light limits everyday activities we take for granted such as sharing a meal or doing your homework. It impacts safety and security and the ability for families to generate an income. 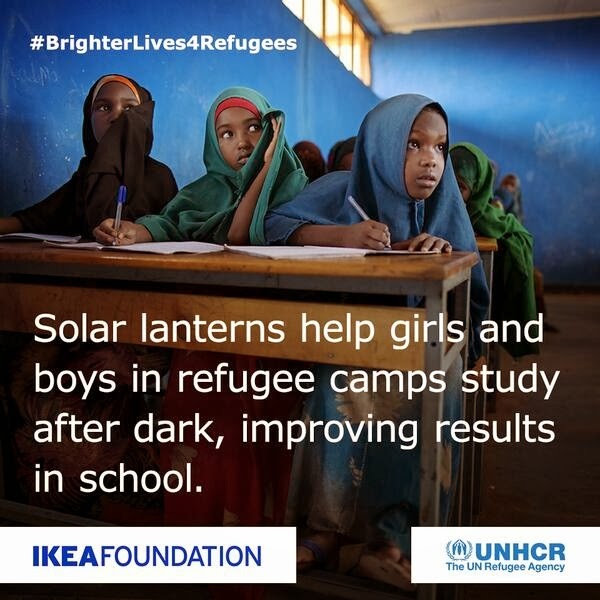 The 'Brighter Lives for Refugees' campaign will help bring lights and renewable energy into the streets and homes of refugees camps, so UNHCR can help build a better everyday life for refugee children and families" explains Per Heggenes, CEO, IKEA Foundation.